You are here: Home / Uncategorized / A Free Resource to Increase Teacher Motivation? A Free Resource to Increase Teacher Motivation? I need feedback from sitting school leaders. In return you get a free resource. I am wrapping up a resource that is designed to help school leaders increase teacher motivation within their districts. 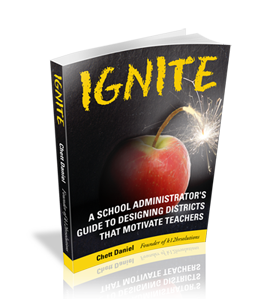 The book, Ignite, is a school administrator’s guide to designing districts that motivate teachers. If you are willing to provide feedback and answer a couple of questions, I will send a complimentary copy of the guide to the first 50 school leaders that respond. That’s it! I want genuine feedback from sitting school leaders and in return I’ll send the first 50 respondents a free unedited guide on how to design a district that motivates teachers. Please use the form on the right side bar of the webpage so I know what level of leadership you hold in your district. This is a limited time offer only for school administrators who are willing to provide useful feedback. I am down to 5 free copies. If you would like a free resource to help motivate teachers in your district, fill out the form on the right side of the page. Current director of special services, trying (successfully) to get the right people on the inclusive bus. Teachers need to be reminded that they are the expert. Encourage teachers to be leaders in areas in which they demonstrate strength and seek input from them often when making decisions.